(Reading, PA) - The Reading Fightin Phils, proud double-A affiliate of the Philadelphia Phillies are proud to announce that tickets for the 2018 Baseballtown Gridiron Classic presented by Redner's Warehouse Markets and Savage 61 Chrysler Dodge Jeep RAM are now on sale! Fans can purchase tickets by calling 610-370-BALL or by going online to fightins.com/tickets. Reserved Seating will be available for all games in the Fightins First Base Grandstand. Reserved seating is limited and will be $8 per ticket if purchased in advance, and $10 if purchased the day of the game. General Admission seating in the main grandstand will be $5 if purchased in advance, and $7 if purchased the day of the game. Groups of 20 or more can also enjoy one free ticket for every 10 tickets purchased! There will also be all-you-can eat buffet tickets available for groups in the pool picnic area, and 3B picnic area. In addition, you can purchase a cheaper by the dozen ticket book, 12 tickets good for any game - for just $48! America's Classic Ballpark will turn into a FOOTBALL MECCA in September and October of 2018. The historic ballpark previously hosted high school football games from September, 1951 through October, 1982. Hosting as many as seven high school and college football games at a minor league baseball stadium appears to be unprecedented. Other baseball stadiums have hosted football games before, but it doesn't appear that any have ever hosted nearly this many football games! But in typical Fightin Phils style - you go big, or you go home! The football presentation will be top of the line. The field itself will be ALL GRASS, as brand new turf will be laid immediately following the Fightins 2018 season. In the past, America's Classic Ballpark football games had been played with the dirt infield still in place. But that will not be the case for the 2018 Baseballtown Gridiron Classic. To provide the best possible experience to the teams on the field, the Fightins felt it necessary to provide a 100% grass playing field - the same way Yankee Stadium provides that for the annual Pinstripe Bowl. As such, the football field will be all grass - the dirt parts of the infield will all be replaced with the same high quality sod that the Fightins play on! The football field will run along the Fightins First Base Fouline. The end zones will be adjacent to the Penn State Health St. Joseph Network '67 Club Picnic Area on the third base side of the stadium, and to the Reading Health System Character Pool Party on the right field side of the stadium. Fans of the teams will be able to enjoy an all-you-can eat buffet in those picnic areas, in close proximity to the football field. Both of those picnic areas are available to groups of 20 or more. The tickets for the picnic areas include a 2-1/2 hour all-you-can-eat buffet. Kids 4 and under are free, and do not require a ticket. Organizations such as alumni associations, or education foundations, that purchase these limited picnic area tickets, could choose to list a higher resale price on the ticket, to serve as a fundraiser for your organization. A unique part of the Baseballtown Gridiron Classic will be the game presentation. First, the Fightins gigantic FirstEnergy Vison videoboard will change the way fans enjoy a high school or division 3 college football game. Starting line-ups, replays, close-ups of the teams, and more will all be displayed on a $1 million dollar gigantic HD television screen! In addition, the Fightins will be working with every participating school to involve as many additional elements as possible to celebrate with that school. In addition to the football teams - high school marching bands, cheerleaders, concert choirs, jazz bands, orchestras, alumni bands, teachers, alumni associations, hall of fame inductions, other sports teams worthy of special recognition, and more will all be cultivated to celebrate that high school at their special game. Further, middle school football teams, marching bands, cheerleaders, concert choirs, jazz bands, concert bands, orchestras, teachers, not to mention elementary school concert choirs, bands, orchestras, teachers, etc. will all be invited to participate and celebrate the entire school district. Local youth football players, cheerleaders, and more will all be invited to be a part of the festivities, and make for the most memorable experience that the school, school district, and town could possibly ever have. The goal of the Fightins is to have every game represent the full community, and celebrate as many elements from that community as possible. The games will feature pre-game performances, post-game concerts, and more! The opportunities are limitless! Those interested in having their organization as a part of the celebration should contact Todd Hunsicker from the Fightins staff at thunsicker@fightins.com. In regard to tickets, current Fightin Phils Season Ticket holders, mini-plan holders and group leaders will have the first opportunity to purchase tickets for all of the Baseballtown Gridiron Classic games. Those fans should contact Mike Becker from the Fightins staff now at mbecker@fightins.com. Group tickets are available in the picnic areas, reserved seats, and general admission areas. Group leaders interested in tickets should contact Jon Nally from the Fightins staff now at jnally@fightins.com. In addition, a Baseballtown Gridiron Classic Season Ticket is available. 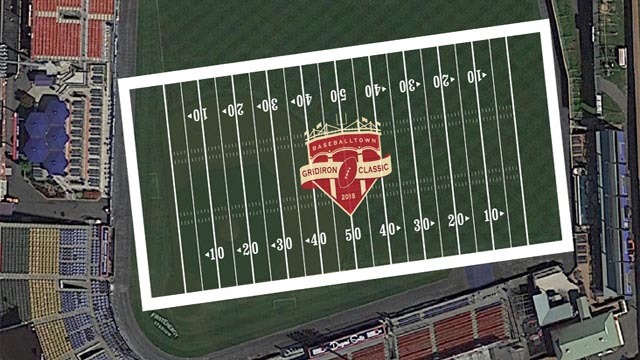 A Baseballtown Gridiron Classic Season Ticket will allow the ticket holder to have the same tremendous reserved seat for all seven football games! That season ticket can be used by an individual football fan to immerse themselves in a lot of football, or by companies looking to reward valuable clients and employees. Fans interested in a Baseballtown Gridiron Classic Season Ticket should contact Mike Becker from the Fightins staff now at mbecker@fightins.com or by calling 610-370-BALL ext. 217. For more information, visit fightins.com/football. Companies interested in corporate sponsorship of the Baseballtown Gridiron Classic, either in its entirety, or for a specific game, should contact the Fightins Front Office now by calling 610-370-BALL. The Baseballtown Gridiron Classic will provide outstanding sponsorship opportunities for interested businesses. America's Classic Ballpark is proud to be a part of Pennsylvania's Americana Region. Individual and season tickets for the 2018 season are available online at Fightins.com, by phone at 610-370-BALL, and in-person at FirstEnergy Stadium. Follow the Fightin Phils on Twitter at @ReadingFightins and like them on Facebook via www.facebook.com/fightins.